The Ragot family have traced their wine growing history back to 1760 when Gabriel Ragot tended vines in Mercurey. About a century later, Louis Ragot established a property in Givry. There he not only grew grapes, but also a number of different crops and raised livestock. Two centuries after the Ragot family began their winemaking, they chose to abandon their other sources of income and focus solely on their five hectares of grapes. By 1973, all of the production on the property, having grown to 7 hectares, was sold in bottle around France. 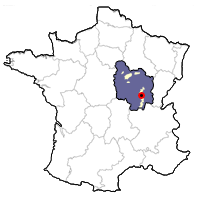 The name of the domaine changed from Ragot Frères to Domaine Ragot, and was run by cousins Jean-Paul and Jean-Pierre Ragot. After Jean-Pierre's death in 1991, Jean-Paul took sole control of the property. His son Nicolas, after studying winemaking in Beaune, entered the society in 2002. Large investments were made in the winery and vineyards the next year, with new tanks and an underground barrel room constructed and certain non-productive parcels replanted. Jean-Pierre retired in 2008, leaving his son Nicolas in sole control of the domaine. Of course retirement doesn't mean much to a French farmer, and Jean-Pierre can still be found in the vines or the cave. The domaine has grown to nine hectares. Nine different wines are released. Three are in Premier Cru. 75% of the vines are at least 40 years old,. The Chardonnay vines are 50 years old. Keeping Herbacides at BayThe vineyard is plowed several times during the year to mechanically remove the grass around the vines, thus avoiding the use of herbicides. Grass and specific plants grow between the vines on every-other row of the vineyard. The Ragots are convinced that this form of healthy competition between native plants and the vines are not only healthy but essential for a live soil that ultimately needs no synthetic fertilizers. All of the fruit is hand-harvested and all of the clusters are de-stemmed. After a cold fermentation, the must begins to heat and fermentation takes place four to six days later. Only indigenous yeasts are used, preserving the integrity of the vineyard's character. A full fermentation normally takes place in 10 to 15 days, depending on the year. 70% of the red wines are aged in barrel. About 20% new oak is purchased each year while other wines see aging in oak foudre. There is no set time that wines spend in cask. Each vintage is approached differently and its élevage is determined after multiple tastings. Normally the wine rests in cask for between 10 and 16 months. Before bottling, all of the barrels are assembled and the wine rests for at least two months to marry the various lots. Bottling takes place at the domaine with the Ragot's own equipment. The wines are lightly filtered to preserve the maximum aromas. After bottling, the wines are allowed to rest for six months before their commercialization. 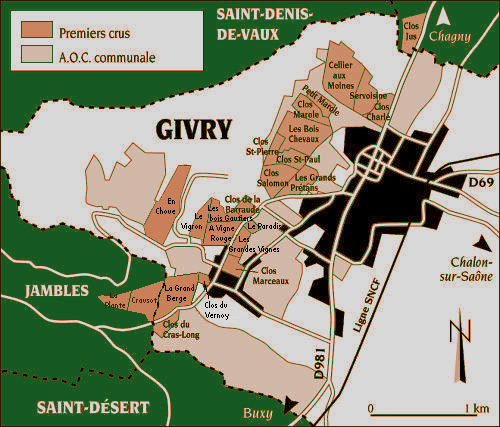 Clos Jus lies at the very top end of Givry. This bottling comes from a 1-hectare parcel that was planted in 1990. The slope of red clay and limestone soils faces due east. Aging takes place in oak barrels, 30% of which are new, for between 12 and 15 months, depending on the vintage. Tasting notes: Its brilliant crimson color emits a bouquet that evokes strawberry, blackberry along with notes of vanilla, licorice, and spice. Pleasurable now with grilled red meats, braised veal or cheeses like brie, camembert or reblochon. This wine will also benefit from four of five years of cellar time and considerably reward the patient consumer. This wine comes from a total of 1.25 hectares ofPinot Noir vines that average 50 years of age grown on clay and limestone soils. Aging is in oak barrels, 20% of which is new, for 12 months. Tasting notes: This wine has notes of black fruits, cassis, blackberry, and raspberry along with some vanilla and spice. A nice match for grilled steaks, pork roast or chicken stew, or hard cheeses like aged gouda or parmesan. This is a new parcel for the Ragot family whose vines were planted in 2009. The vineyards lies along nearly 3/4 of a hectare and had been covered by forest. After clearing the east-facing hillside, they planted Pinot Noir in high density (10,000 vines/hectare) on its clay and limestone soils between 290 and 325 meters altitude. After a manual harvest, the wine is aged in oak, of which 40% is new. This is a delicious wine that is more forward than Clos Jus and lighter on its feet than Grande Berge. This Premier Cru is located in the south of the appellation, along a east-facing slope that is very rocky and therefore allows for excellent drainage. The Ragots have five parcels here, totaling 2.14 hectares, varying between 15, 30 and 50 years of age. Grande Berge produces wines that are more known for their subtlety and finesse than for their power. Harvest is by hand, the grapes are de-stemmed and yeasts are indigenous. Aging takes place in oak (30% new) for between 12 and 15 months. Tasting notes: This wine has plenty of red cherry fruit with subtle notes of undergrowth and spice.